Everything you need to keep your 12 gauge shotgun in prime working order from Outers. Everything you need to keep your 12 gauge shotgun in prime working order from Outers . Easy-to-assemble aluminum rod with rotating handle for thorough bore cleaning. 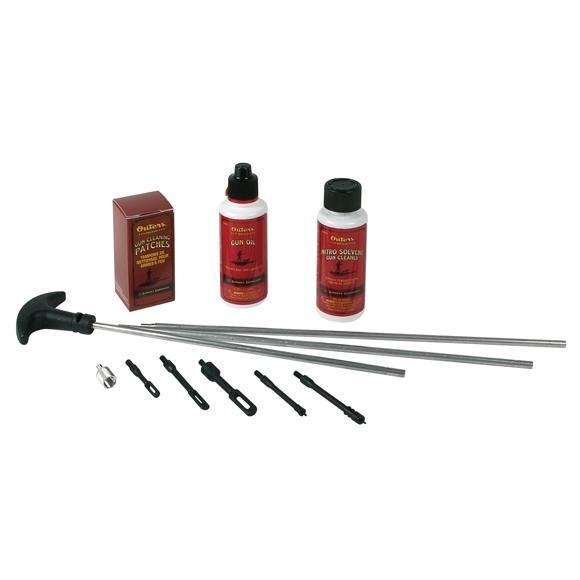 Nitro Solvent Gun Cleaner to deep clean chambers, bores and gun parts. Gun Oil Rust Preventative to ensure smooth operation and corrosion protection. A selection of tips, brushes and/or mops matched to each specific kit. A variety of patches in the right caliber or gauge sizes for precise fitting. Sturdy box for secure storage and transport. Nitro Solvent Gun Cleaner 2-ounce bottle.